YAReG (written by Andreas Kunz) is a free graphical frontend for rfstool (written by Gerson Kurz). It provides easy and comfortable read access to your ReiserFS formatted Linux partitions through an user interface familiar from Windows Explorer. This is the YAReG application window. On the left you can browse your ReiserFS partitions as a tree. 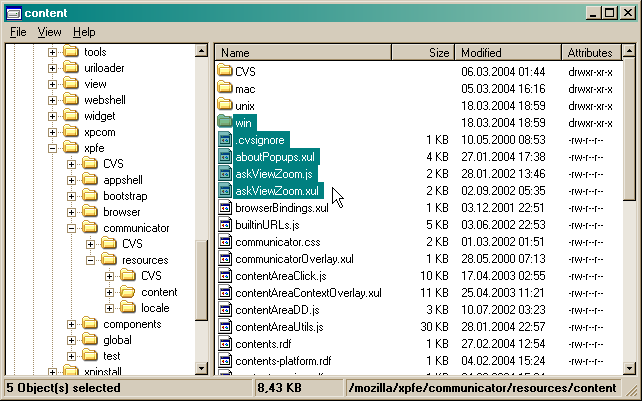 On the right the contents of the selected directory are listed. This is where you can drag files and folders from to the Windows Explorer or other applications. YAReG's usage should be self-explanatory to anybody able to create a ReiserFS partition. YAReG is a .NET application. This means you need to install the Microsoft .NET framework (free download from Microsoft: version 1.1 / version 2.0) prior to running YAReG if it is not already installed. Yes, I know, this is more than 20 MB to download just for running a tool that is less than 100 kB in size. But the only reason YAReG exists is that I wanted to get familiar with programming C#/.NET applications, so there is no way YAReG would exist as a non-.NET application. Accept it or leave. And consider that more and more applications will require .NET, so you will end up installing it sooner or later, anyway. You need to have a fully operational copy of rfstool. Starting with YAReG 1.0, rfstool.exe is included with the YAReG zip archive (which is licensed under the GPL since version 1.0, so it now is allowed to integrate both of them increasingly). If you - for some reason - have no copy of rfstool, you can obtain it freely from Gerson Kurz's homepage. The rfstool executable needs to be in the same directory as YAReG.exe. On Windows 2000 and XP you probably need administrator privileges; rfstool.exe is everything else you need. 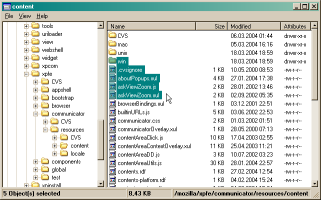 On older Windows versions you also might need to have the RAWIO dll's provided with the rfstool package in the same directory. User reports suggest that you should run YaREG with full administrator privileges. This sounds reasonable, given the type of job it does... If YaREG does not show any existing ReiserFS partition, insufficient privileges might be the reason. For huge amounts of data (more than maybe 10 or 50 megabytes) it is recommended to NOT use the drag&drop functionality, but to use the context menu of selected files/folders instead. While not being as handy this improves the overall performance dramatically, for the reasons described below. When you drag and drop files from the YAReG window, they first have to be extracted from the Linux partitions to a temporary directory on a Windows partition to be accessible for the Windows drag-and-drop architecture. This temporary directory (" YAReG-temp")is created at application startup . You can optionally configure where to create this temporary directory by editing the YAReG.exe.config file. If you choose not to do so, the Windows temporary directory is used (set by the TEMP environment variable). If this environment variable does not exist, YAReG uses its own directory to create YAReG-temp. When you start a drag-and-drop action, the files will be copied from the Linux partition to the temp directory instantly (not only when you release the mouse button!). If you selected large or many (e.g. within dragged directories) files this will of course take some time. During this time the mouse pointer will not look like you are dragging something, but it will nevertheless work (you can release the button over your desired drop target). Starting with YAReG 1.0 the files are not copied, but moved from the temporary to the target directory. This speeds up data transfer a lot of both of them are on the same partition (speed is the same as using the context menu for copying). So if you only work on one partition anyway, both methods to transfer files are equally fast. YAReG, as it exists right now, has been programmed on one day and then rewritten from scratch on another day (ok, and extended on 1-2 other days). Still, the functionality it provides is comparable or superior to other GUIs for rfstool. (This is why I am providing it to the public.) But of course there might be shortcomings and problems. This is a good place to mention that you are using YAReG on your own risk! It comes with ABSOLUTELY NO WARRANTY and I am not responsible for any problems or dataloss the usage of YAReG might cause. That said, the only place it is writing to is its temporary folder and the target for the files to transfer. ReiserFS partitions are only read from (rfstool only provides read access). The "History & Future" paragraph below lists all important bugs in previous versions that are now fixed, so you can check if an update cures a problem you might have noticed. If the problem you found is neither listed there, nor in the above list of known problems, please let me know! It is recommended to regularly check back for newer versions with all the lates fixes and improvements. Please read the README! part before downloading to avoid regretting anything! You do not need to install YAReG, just run YAReG.exe after unzipping the download (e.g. using WinZip). If you cannot start YAReG make sure rfstool.exe is in the same directory and you have the Microsoft .NET framework installed (either version 1.1 or 2.0). If you think YAReG is helpful and you want to support or thank for its development, you can now donate using PayPal. When people approach me about donations, I usually refer them to charity organizations. Those need the money more urgently than me, so I do not really want to change this now. If you do any modifications to YAReG and plan to publish them, I ask you to contact me, so both development branches benefit from each other. I will strictly prosecute any GPL violations (e.g. if YAReG code is used within other software that is not GPL-licensed). Please contact me if you encounter any application that reminds you suspiciously of YAReG. YAReG is © 2004-2010 by Andreas Kunz. YAReG is GPL-licensed: redistribution and/or modification is permitted under the terms of the GNU General Public License (http://www.gnu.org/copyleft/gpl.html) as published by the Free Software Foundation; either version 2 of the License, or (at your option) any later version. YAReG comes with ABSOLUTELY NO WARRANTY and I am not responsible for any dataloss or damage to your system or files. YAReG is Freeware: free distribution of the YAReG binaries is permitted. Improved: While files/folders are being transferred from the ReiserFS partition to the temporary directory their names are displayed in the status bar (this is what happens before Windows-drag&drop starts). If you drag folders, only the folder name is displayed, not the name of all the files contained within the folder. Improved: You can double the speed of data transfer right-clicking on the selected files/folders in the right-hand part of the window: After selecting "Copy to..." you can select the folder where to put the data. This way no temporary directory is involved and all data is only copied once, making this way to transfer files twice as fast as the original (drag&drop). Once you copy more than 10-50 megabytes this way to copy files is recommended because the speed difference gets remarkable. Improved: You can now (optionally) configure which temporary directory YAReG should use in the YAReG.exe.config file now also delivered along with YAReG (its name must start with YAReG's name, it must be placed next to YAReG). If you do not enter anything in this file, YAReG proceeds as before: it first looks for the environment variable TEMP and if that does not exist, it uses its own directory to create the temporary directory. Improved: In the "About" dialog ("Help" menu) the temporary directory used is displayed as well as the version of the .NET framework that is used. Fixed: crash/exception on startup if "rfstool autodetect" returns an error amongst valid data. Improved: Some more error checking, especially when calling rfstool. Fixed: bug that prevents dragging objects with spaces in their name. Now creates (and removes) its own temp directory. These cases seem to be about standalone storage solutions and/or NAS systems ("network-attached storage") where the system as such has ceased to function properly, but the hard drive itself was undamaged. As such systems require a network stack on their own it is logical that many use a kind of Linux and some of those use the ReiserFS file system. So if you can successfully attach such a ReiserFS-formatted hard drive to your computer chances are that you can use YaREG to copy over the data to your Windows partition. Of course this does not work once the hard drive is physically damaged - there are commercial services to rescue valuable data in this case. An alternative to YaREG would be using a Linux Boot CD (like e.g. Knoppix) to boot your computer from. Those do not modify your hard disk but you can access your Windows partitions and most probably also any ReiserFS partitions. Good luck! The last time YAReG moved (to yareg.akucom.de) was the day when the Olympic Summer Games in Athens were beginning. Funnily there are again Olympic Summer Games ongoing now, this time in Beijing (they admittedly have already started a couple of days ago). And again (or still?) YAReG is the first hit when people google for "read reiserfs windows". And there are still a lot of downloads (11,000 in 2008 so far). However, visitors of this page should not notice any change because the URL/domain has remained the same. But if you experience any problems, in particular when trying to download, please let me know! As of now, YAReG has been downloaded more than 53000 times, with a rate of about 105 downloads per day through the last month. YAReG 1.0 only came out half a year ago, but already has a pretty good share of the downloads (about 21000). The YAReG source code have been downloaded more than 400 times (but I do not know of any patches done by someone else yet). Thanks for your interest in YAReG! It feels good to know one has built something that is useful for other people as well. Today, exactly two years after YAReG's birth, YAReG 1.0 was released. See the history for a list of fixes. Most notably, the speed of drag&drop actions when the target and the temporary directory are on the same partition was dramatically increased (as fast as the context menu "Copy to..." method) and the files can now be sorted. Furthermore, YAReG is now licensed under the terms of the GPL, which does not change anything for the average user, but means e.g. that you can now also freely obtain the source code. See the history for a list of fixes. All most frequently requested improvements have been implemented: an option to transfer files MUCH faster (actually twice as fast), some progress feedback while files are being transferred and the option to configure a custom temporary directory. Again, go to the history section to read details about these improvements in the first YAReG release after a long time, almost exactly two years after YAReG was initially created. By the way: YAReG has been downloaded more than 32000 times by now... :-) Those idiots who sometimes download YAReG 20000 times within two hours are automatically filtered out, only unique downloads are counted. Several weeks ago Microsoft introduced the new version 2.0 of their .NET framework. I did some testing with YAReG 0.9.9 and apparently it runs perfectly fine with it. So it does not matter whether you have installed .NET 1.1 or 2.0. If both framework versions are installed, it also does not hurt: YAReG will the run using the 1.1 framework. August 09th, 2005: YAReG 0.9.9 included on the CD of the german magazine "PC-Welt"
The September edition of the german computer magazine PC-Welt includes YAReG 0.9.9 on its CD-ROM -- my voucher copy arrived today. They also put rfstool 0.14 on the CD so all you have to do is copy over rfstool.exe to the directory where you extracted YAReG in order to easily access your reiserFS partitions (assuming you have the Microsoft .NET framework installed). August 06th, 2005: YAReG mentioned in german computer magazine "c't"
Edition 17/2005 of the well-reputed german computer magazine c't mentions rfstool (on page 188) and adds: "Whoever considers using the command line being too bothersome, may use one of the graphical frontends, e.g. Yareg, which allows for easy drag & drop to the Windows Explorer." A nice eye-catching screenshot is also included. There is a "soft-link" to YAReG mentioned which is located at http://www.heise.de/ct/05/17/links/188.shtml. [Addition:] Due to a drop in Google's ranking, YAReG only had about 40 downloads per day during the past one or two weeks. This c't link, however, led to a huge increase in download numbers, reaching record-breaking 133 downloads on August, 9th! I know there were no actions on my side during the last months. This was not caused by a lack of interest in YAReG but rather by 1.) lack of time due to my diploma thesis and 2.) lack of urgent need for further development because YAReG seems to work well enough for everybody -- at least only minor problems have been reported to me. YOU, on the other hand, were quite restless: by now, YAReG has been downloaded more than 14,000 times!! (currently 50-80 downloads per day, rate is increasing) Thank you! And thanks for the encouraging mails! Today, I touched the YAReG code base for the first time in months, nothing special, just preparations for releasing YAReG as open source software. This may or may not happen soon. Whenever it happens, it is likely to be combined with some improvements to the application. Improving the transfer of huge amounts of data is my top priority in this respect because it was the only real complaint I heard of. See the history for a list of fixes. YAReG was completely rewritten, see the history for details. I thought the world might find YAReG useful. So there is a web site now. YAReG was first created that day. YAReG is © 2004-2010 by Andreas Kunz. Please contact yareg@yareg.akucom.de if you have any comments or bug reports. Usually I answer every mail; if you do not receive an answer my spam filter may have eaten your mail... just try to resend after a while. For terms and conditions of using this web site read the disclaimer.